Knork 45 piece set matte includes: 8 place settings, each place setting consists of 8 ea dinner Knork, salad Knork, place knife, place spoon and teaspoon, plus a 5 piece serving set all with the KNORK's distinctive styling. 18% chromium, hand-forged from a single solid bar of stainless steel for unmatched weighting and balance. Matte finish - a brushed satin finish that's perfect for everyday use. 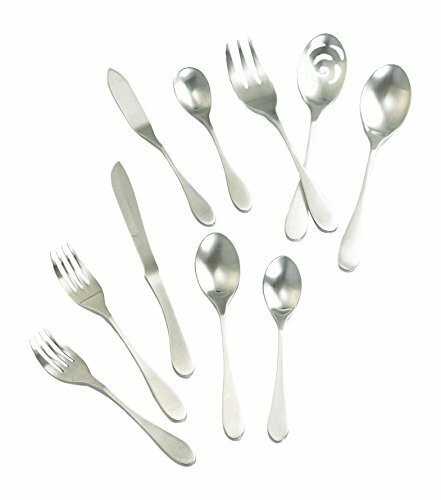 Designed with purpose, Knork flatware offers superior functionality unlike any other. Modern design and practical function converge to create the ultimate game changer in the art of dining through its signature piece, Knork. The KNORK's rise in popularity stems from its simplicity- a redesigned, better version of the fork! there is nothing left to do but savor the flavors of each meal as nature intended - enjoy the steak made juicier, salad made crispier, and potato made perfect. Backed with a lifetime warranty. Dishwasher safe - 18/0 stainless steel will last a lifetime without issues, with proper care. If you have any questions about this product by Knork, contact us by completing and submitting the form below. If you are looking for a specif part number, please include it with your message.